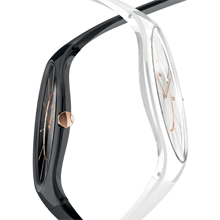 Rado, the ever innovative Swiss watchmaker, has now produced another world first, the Rado True Thinline. Already highly regarded for its form, function and contemporary design, the Rado True collection is set to revolutionize the world with its new line: Rado True Thinline, the world’s thinnest high-tech ceramic watch. 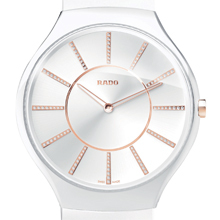 Rado has taken its knowledge of high-tech ceramics to another, almost defiant, level. 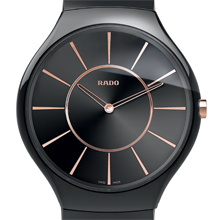 Pioneers of this high-tech material since 1986 in the watchmaking industry, and now producers of the thinnest ceramic watch in the world with The Rado True Thinline. To allow this new ultra thin structure, all of the components have been intensively reworked to ensure they are fully integrated, including the quartz movement that is exclusive to Rado. Demanding and challenging in its manufacture, the Rado True Thinline will offer all the key properties of high-tech ceramics, such as luxurious comfort and strength, as well as adding a new dimension of being lightweight to the extreme. With its simple and elegant case the collection features clear gold coloured indexes, replaced by diamonds on the Jubilé version, all accentuated by the fully integrated sapphire crystal of the dome. The case and buckle, both in high-tech ceramics, fit perfectly into the sublimely integrated rubber bracelet. Sensual, stylish, and effortless to wear, a world first for watches.